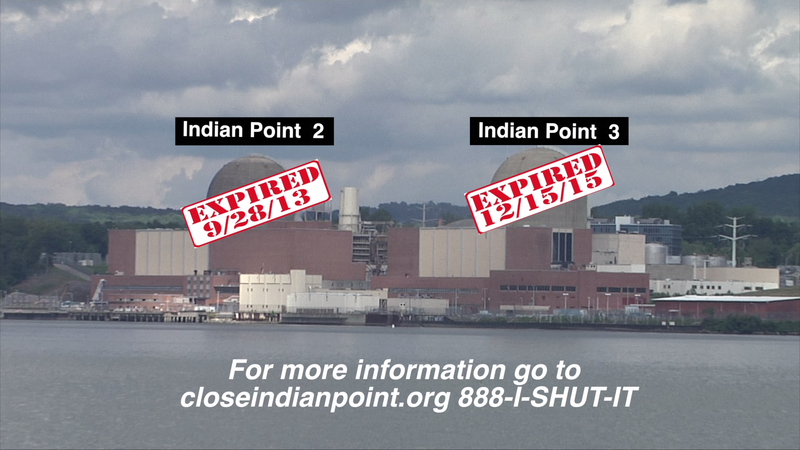 JOIN US – From Fukushima to Indian Point, What’s in Our Future? 936 McKinley Street, Peekskill, NY. March 11 of this year marks seven years since the Great Eastern Earthquake in Japan triggered the ongoing disaster of Fukushima –the meltdown of three nuclear reactors, the initial release of radiation that traveled around the globe, the continuing release of radiation into the Pacific Ocean and the proliferation of giant tanks containing highly radioactive water. 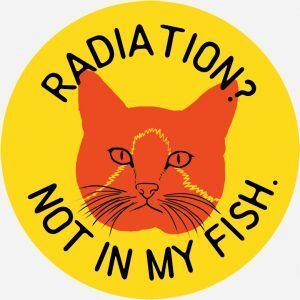 As efforts to contain the release of high levels of radiation have failed, the flow of information about what is actually happening has become increasingly restricted by the Japanese government. 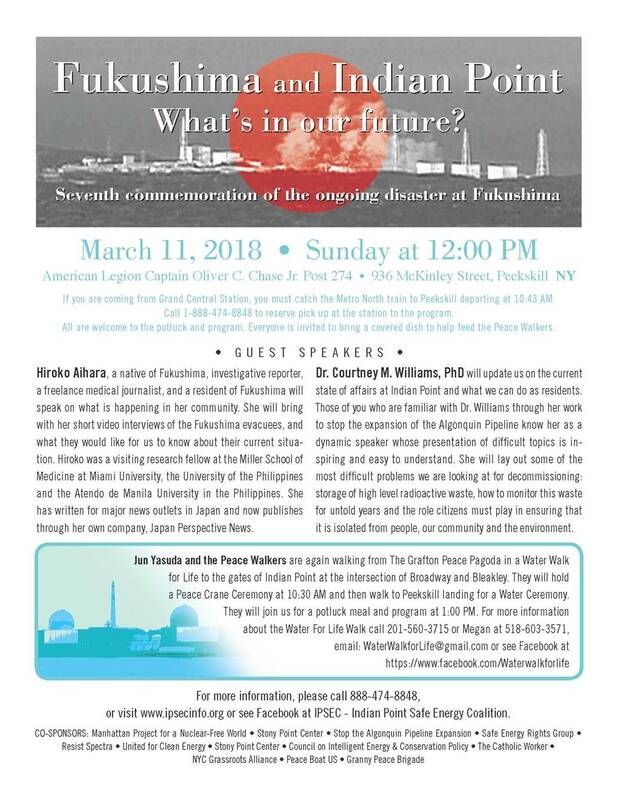 On Sunday, March 11 you will have an opportunity to hear Fukushima native, Hiroku Aihara, give a firsthand account of what is actually happening in Japan. Hiroko is an investigative reporter and freelance medical journalist who was a visiting research fellow at the Miller School of Medicine at Miami University, the University of the Philippines and the Atendo de Manila University in the Philippines. She has written for major news outlets in Japan and now publishes through her own company, Japan Perspective News. She brings with her the voices of others who were forced to flee their homes. Dr. Courtney Williams PhD brings her scientific expertise to issues involving the health impacts of energy infrastructure. Courtney holds a B.S. in Molecular Biochemistry and Biophysics from Yale University and a PhD in Molecular Biology from Princeton University. She completed her post-doctoral training in biological engineering at MIT before transitioning into industry. She is currently a cancer researcher at a biopharmaceutical company. 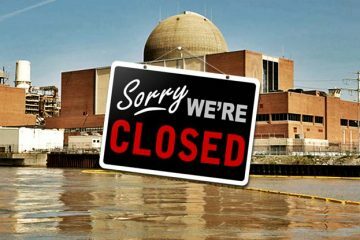 Courtney will update us on the current state of affairs at Indian Point. 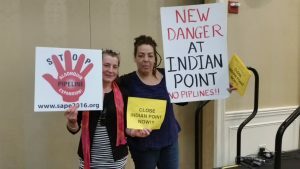 Those of you who are familiar with Courtney through her work to stop the expansion of the Algonquin Pipeline know her as a dynamic speaker whose presentation of difficult topics is inspiring and easy to understand. Jun-san Yasuda of the Grafton Peace Pagoda and the Peace Walkers will be joining us. Walkers will meet at the Cortlandt Train Station for the last leg of their journey at 9:00 AM on March 11 and walk to the gates of Indian Point for a Peace Crane Ceremony at 10:00 AM. They will then walk to Peekskill Landing for a Water Ceremony. After that they will join us at 1:00 PM for our program at the American Legion Hall which will already be in progress. Everyone is invited to bring a covered dish to help feed the Peace Walkers. All are welcome. For more information about the Peace Walkers and their schedule before March 11 email WaterWalkforLife@gmail.com.